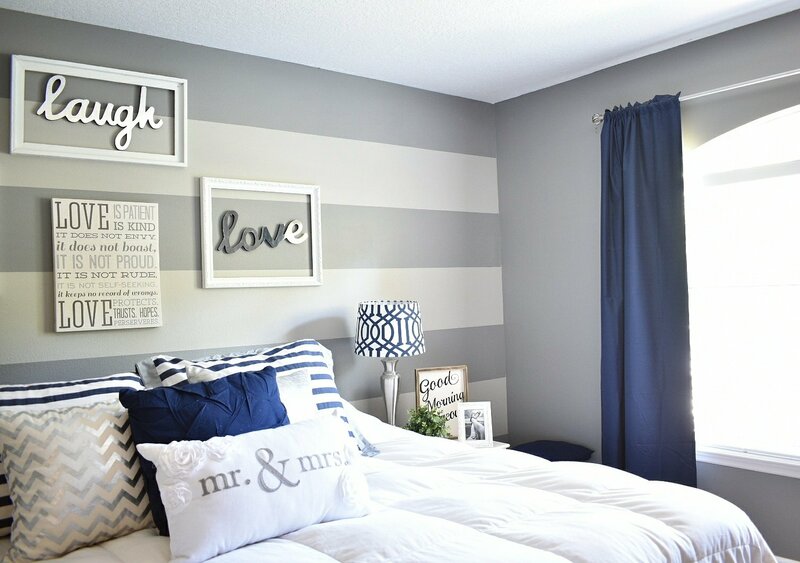 In today’s post I’m going to be talking about one of the very first projects I took on in our home, painting an accent striped wall in our master bedroom. Our master bedroom was the first room I decided to tackle after moving in. Considering it’s the room we end and begin each and every day in, it just seemed like an important place to start. Laser Level-this thing was a life saver, I got mine here. Ok, now that you know what all you need, let’s get started! First, you want to pick your colors. For me, this part was easy. I knew that I wanted something classic, something timeless. I wanted a color that I could go to sleep every night and wake up every morning looking at and never get sick of. To me the color grey was an absolute no brainer. Now that was the easy part, knowing I wanted to use grey. However, finding the perfect two shades of grey…now that was a whole different story. *Always remember, sample colors are your friend. Next, you want to decide how many stripes you want. You may wish to do several skinnier stripes or a few thicker stripes. The choice is yours. Once you decide the look that you desire you then need to measure the wall you are wanting to paint. Remember, if you have baseboards or crown molding not to measure those. You only want to measure the “actual” wall in which you are painting. Then, you just divide the length of the wall by the number of stripes you want to get the measurement of how big each stripe will be. Now that you have the stripes measured and the tape up, the rest is a breeze. I wanted the DARK grey stripes to be at the very top and very bottom to create a contrast against the ceiling and the base boards. Once I figured that out I labeled the LIGHT stripes with a pencil to completely eliminate the possibility of painting the wrong stripe. Since DARK grey is my main color I took the DARK grey and painted the inside of the tape that outlines the LIGHT grey stripe. I did this for two coats. If you think about it, if the DARK grey paint bleeds a little it’s going to bleed into the DARK grey. After that dried I then painted the LIGHT grey stripes. So essentially you are just painting the main color on the borders of your accent color BEFORE you paint your accent color. That way your accent color doesn’t bleed. Make sense?! It’s as easy at that. Give the paint plenty of time to dry then feel free to decorate the wall as you please and enjoy. I chose to keep my decor on the stripe wall simple. I didn’t want anything to bold that would take away from those stripes I just worked so hard on! Hope this way helpful, it was a little bit of work and a whole lot of learning as I went, but I will definitely say it was well worth it! It added just the little bit of “pop” that our master bedroom needed. I swear if we ever decide to move I am taking this entire wall with us! ‹ PreviousWhy I started a blog? Paige, I love seeing all that you are doing to your little “love nest”! I can’t wait to see what is next. Loooove this!! !thanks for sharing!! !what is the name of the paint color in this room and your house? ?